So I guess the surge north continues, with the addition of office, hotels, residential and an enclosed mall this seems well placed to support growth further north and expansion of the tollway into Grayson County. Say hello to Marilee and Gunter, the expansion of the metro marches on. I'm not as familiar about development or growth in this part of town, but aren't there already concerns about too much congestion on 380? Oooooo finally something more exciting released about this mysterious mall development. When it was announced last year that they would be putting a mall here, I was expecting a small strip mall. Nothing special at all. Now after reading about it and seeing what appear to be VERY early renderings (from Google SketchUp), I can say this looks much more exciting than just any ole strip mall. 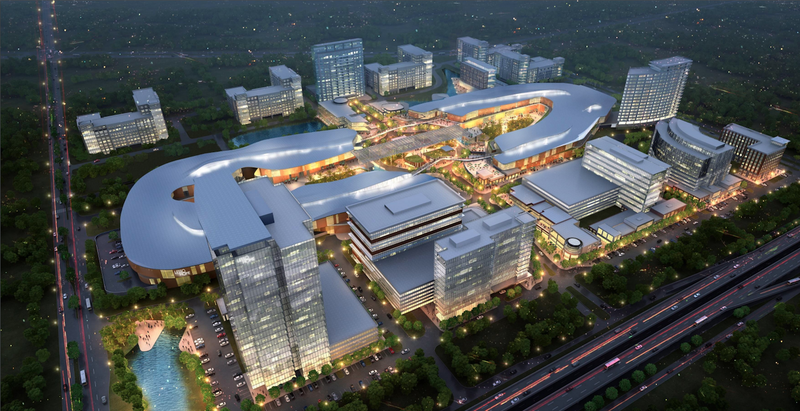 In fact, if it happens according to plan, it'll do exactly what Stonebriar mall, Willow bend, and the Galleria should'a did... encapsulating a true urban center, focused around a mall. In a city review of the development they did a traffic assessment, and once the expansions to Highway 380 are complete, it looked like the congestion wasn't going to be bad. What the inner courtyard of the mall could look like, I'm seeing the BARE BONES of a more futuristic hong kong style building, which I have to say that I will love if they execute it correctly and style the surrounding buildings similarly. Heres what one of the 14 story hotels could shape up to be. and here is one of the seemingly more conservative 9 story apartment buildings. And lastly here's a look at the plans. The shape of the mall is VERY interesting and it has so much potential to be a really cool piece of architecture in the city. Wow this is quite a project. Now why can't we can some international capital to buy up the Riverfront or Spire project? If the mall does get built, I'm not sure what kind of retail environment we'll have by then. There have been many store/chain closures in the last 2 years. This may not be the traditional mall of old we're used to. All that said, this same corner of US 380/DNTollway has been the "future site of" more than once, and, well, it's still not a "site of". Hopefully this won't be a Wade Park 2.0. ContriveDallasite wrote: Wow this is quite a project. Now why can't we can some international capital to buy up the Riverfront or Spire project? Haha, my thoughts exactly. Looks like an amazingly ambitious project, and I'm quite envious that we don't get stuff of this caliber closer to Downtown. Well, best of luck to this development, it would be cool to see it take shape. With all the growth we are seeing up north, I feel like we'll eventually create another 'node' to the DFW metroplex that might one day be able to hold it's own against Fort Worth and Dallas. I feel like the DNT/121 intersection has the demand for something big, but the developments in that area lack any sort of long term vision. Perhaps this development (if it happens) could be the anchor for a new DFW 'node' up north. I know trying to compete with Fort Worth or Dallas is an insane thought at this point in time, but, with the amount of growth happening there, they certainly can have the population to support something in the distant future. If they can actually embrace true urban development, and not this partial urban/suburban crap we have seen recently, then they may be able to at least lay the ground work for something big. I do see this as being a much more futuristic version of a shopping mall, geared toward the slow decline of brick and mortar stores(?). However, the whole mall experience of being able to go in store, try it on, and buy it immediately isn't the same as doing it online. therefore regardless of what people may say I personally don't see malls dying out completely anytime soon, especially if they are done like this, surrounded by an urban environment with people around 24/7. Looks great from above, and seems to be better from ground level! There's so much going on in Collin County, even I'm surprise. These pictures really make me think about what will happen with NorthPark when that mall enters the 21st century when the recurrent open air, mixed use, live-work-play, office and entertainment expansion day dreams become tangible. This would certainly help solidify the next major business center going up the tollway that never seems to end. Wonder what is after this? During the next century, the well-being of Collin and Denton County residents is directly related to urban growth boundaries established before too much longer. Development rule of thumb north of Hwy 380, if the land drains to Lake Lewisville keep it rural, if the land drains to Lavon build it out. I honestly hope this doesn't happen , it is too far north , and if it did I really don't see it being anything more than something out on it's own surrounded by suburban houses. Plus, if this is truly going to be on the corner of the tollway and 380....dear God the traffic nightmare that will be. On top of that, the drive to the north is going to have to stop at some point. If this was further south on the tollway fine, but it is going to be massively out of place. It seems like it was a group of investors not familiar with the are that wanted to develop a mall, looked for cheap land in Frisco near a highway and just decided to build there without extra thought. whit5125 wrote: It seems like it was a group of investors not familiar with the are that wanted to develop a mall, looked for cheap land in Frisco near a highway and just decided to build there without extra thought. All the growth happening this far north just feels like it's from people hoping this area will become the next Frisco, but aren't really thinking about things like traffic and distance away from everything else. That's what this development feels like to me. It seems like maybe they are hoping this intersection will be the next DNT/121. Maybe I'm wrong, and maybe this area will boom, but I agree with you, it's just too far from everything else and traffic will indeed be a nightmare. "...Newmark Knight Frank resigned from the project..."